The Maryland Airport is a privately owned airport just outside Bryans Road serving "general aviation" (i.e. non-commercial aircraft). Beginning in the 1940's, it serviced small propeller planes. But in the 1990s, pro-growth forces began an effort to expand the airport and to leverage it for industrial development of the surrounding ecologically valuable forests. In 2013, the Federal Aviation Administration paid to lengthen the runway to enable use by corporate jets. State and county funds were also used. To lengthen the runway, the stream valley of a Mattawoman tributary was filled against the strenuous objections of federal resource agencies. In 2016, it appeared that the forested land surrounding the airport would be protected when Charles County's Comprehensive Plan placed it within a Watershed Conservation District. However, in 2017 a last-minute amendment to the zoning ordinance implementing the Comprehensive Plan calls this protection into question: planning staff was directed to develop an overlay zone that would allow the land around the airport to be industrialized, with environmental conditions. As made clear below, it will not be possible to industrialize the area while conserving the extreme environmental sensitivity of the surrounding forests. Further, market studies find the area to be economically uncompetitive, so providing needed infrastructure like sewer would not be in the taxpayers' interest. Black double line indicates the lengthened runway and taxiway as configured in 2017 (3750 ft long). Dotted extension of the double line shows the planned full length of the runway (4300 ft). This would require leveling the forest behind some houses within the yellow area to provide clearance for take-offs and landings (pending approval of a Supplementary Environmental Assessment). Red boundary: An area where developers had earlier secured industrial and business-park zoning as part of an effort to "punch through" development to western Charles County. Dashed red line encloses 277 acres of a failed public-private scheme for a tech park. After six years, that project collapsed for want of tenants, and the land was repurchased by the county at a loss. Today, the land is within the WCD and is known by some as Pomonkey Forest. Is is ideally suited for outdoor education. Airplanes often fly over J.C. Parks elementary and Matthew Henson middle schools. 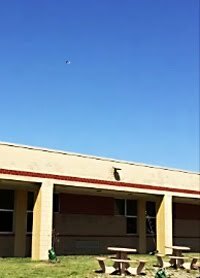 The airport is also very near two schools. These suffer from noise as planes circle overhead, especially the outdoor classroom activities. Aircraft also cause air pollution; note that propeller planes still use leaded gas. -would maintain the very high ecological values of the forested area. Note that sewer for surrounding development would then enable an airport terminal, which could lead to greatly increased aircraft operations. This would inflict noise and pollution on the nearby schools, and is opposed by local residents. Not smart. A belated market study found that the tech park's location in western Charles County makes it unsuitable for commercialization. While the tech park has failed, the study is relevant to the forested land next to it and around the airport. It's smarter to locate in improved commercial sites looking for tenants along the U.S. 301 transportation corridor, or to redevelop in economically distressed Indian Head. The market studies are based solely on traditional ledger sheets, and so ignore the enormous environmental costs and loss of ecosystem services that would occur if the area were industrialized. See for example, the map below of "Stormwater Natural Infrastructure" that shows the area is providing stormwater treatment and flood prevention services for free. During construction to reorient, broaden, and lengthen the runway. 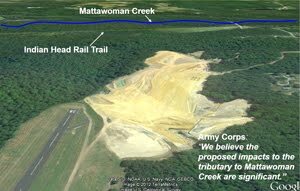 "It is our opinion that the proposed airport improvements would cause significant long-term adverse effects to Mattawoman Creek… Such adverse effects would degrade the existing high-water quality…." "The runway realignment will have devastating impacts on the subject watershed. We are particularly concerned with the destruction of the sloped, forested riparian zone, which will drastically alter instream hydrology… We are also concerned about cumulative impacts this proposal will have on wetlands and instream habitat throughout the local region." Land of great ecological value. The maps below detail the environmental sensitivity of the lands around the airport. Let's not add the insult of industrializing this rural area to the injury of destroying a tributary. Black outer border: encloses area of the airport land-use study described above that was devised to justify more development. Blue outline: failed tech-park site. Inner black border: land that had previously been zoned for industrial and business park use. While this area is now in the Watershed Conservation District, it presumably is to be included in the overlay zone aimed at reopening the land to industrialization. The land is simply too sensitive for such consideration. As noted above, its present forested state also has a direct human benefit: it reduces air pollution from aircraft operations. Right map above: Forest-interior-dwelling habitat (green hatched) and Audubon Important Bird Area (red outline). The presence here of threatened bird species reflects the largely unfragmented "forest interior" (green). This increasingly uncommon resource is prized because it is home to those species (for example the wood thrush) that can only live in deep woods (typically taken to be about 100 yards from the forest edge). Left map above: High priority Water-quality Protection Watershed (yellow). The Chesapeake Bay Program, the inter-agency partnership that oversees restoration of the Chesapeake Bay, has a "healthy watershed" program. The program prioritizes lands for protection to better guard the health of remaining high-quality Bay tributaries like Mattawoman Creek. Middle map above: Sub-watershed feeding a Maryland sentinel site (red). The Maryland Dept. of Natural Resources (DNR) maintains "sentinel sites" on relatively undisturbed streams for use as long-term references. The site on Mattawoman Creek fed by the red area is "one the best" in Maryland for its diversity of reptiles and amphibians, according to DNR (8.5 MB pdf). Right map above: Priority watershed for sustaining vulnerable migratory fish (blue). The healthy watershed program (described for the left map above) identifies lands important to sustaining anadromous fish. These migratory fish live in the ocean but return each spring to spawn in the freshwater of their birth. Mattawoman Creek is renowned as a spawning and nursery ground for river herring, hickory shad, white perch, and "semi-anadromous" yellow-perch. Left map above: Mattawoman Stream Valley (green). In their Mattawoman Creek Watershed Management Plan, the Army Corps of Engineers strongly recommended protection of the stream valley (including tributaries) to the tops of slopes. The Army Corps made this their single most important recommendation. The Maryland Dept. of Natural Resources then mapped the topography using a sophisticated computer program, and Charles County superposed it onto a parcel map. Middle map above: Stronghold Watershed (green stipple). Wetland of Special State Concern (heavy green line). Maryland's Dept. of Natural Resources characterizes Stronghold Watersheds as “those watersheds in the state that are most important for the protection of Maryland’s aquatic biodiversity.” The Wetland of Special State Concern, called "Pomonkey School Stream" by state statute, is recognized for its biodiversity. Right map above: Steep slopes. In this map from the Army Corps of Engineers subwatershed profile, steep slopes appear darker brown. The prevalence of steep slopes calls into question any zoning for industrial and business parks. Left map above: Bionet Tiers (1, orange; 2,purple; 3, blue; 4 & 5, dark & light green). The Maryland's Bionet program maps areas according to the strength of biodiversity. The airport area is dominated significant areas. A fact sheet describes Tier 2 lands as "Extremely Significant for Biodiversity Conservation; "Tier 3 as "Highly Significant...;" Tier 4 as "Moderately Significant...;" Tier 5 as "Significant..."
Middle map above: Natural stormwater treatment (blue-greens; green is preserved). The Watershed Resources Registry is a mapping tool that analyzes various land-values with an eye to locating opportunities for sustainable development and places better left preserved. This map shows where mother nature provides stormwater treatment for free, an example of an ecosystem service provided by forests, wetlands, and floodplains. These natural features filter out pollution, assist water infiltration, and reduce flooding by storing stormwater. Dark green areas are state-preserved lands and so were not analyzed in by Watershed Resources Registry. Right map: Upland areas worthy of preservation (yellows; green is preserved). Another map from the Watershed Resources Registry. Upland areas exclude stream valleys and floodplains. 1 The airport land-use study considers the failed tech park as part the industrial zone around the airport. 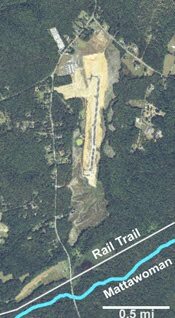 If the tech park ever were resurrected, it would taxpayers $8 million in sewer, according to a letter from Edith Patterson, then vice-president of the Charles County Board of Commissioners, to the Mattawoman Watershed Society, November 17, 2010. Costs are based on sewer to the failed Science and Technology Park in two phases, plus interest. The airport would use the same sewer. 2 Letter in the record from Wink Hastings, National Park Service, to Maria Stevens, FAA, dated June 29, 2001. 3 Letter in the record from John Nichols, NMFS, to Rich Bulavinetz, ACOE, Baltimore District dated Oct. 12, 2001.